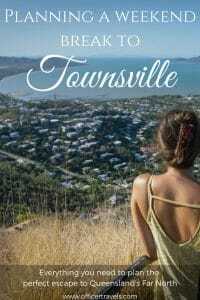 Things to do in Townsville and why we think it's a travellers paradise! Have you ever arrived at a town that completely blew your expectations away? When we spent a couple of days in Townsville, Queensland, it did exactly that! We knew you could get to Magnetic Island from here, but we weren’t really sure what else we’d find. As it turns out, it’s is a really pretty place and there’s plenty of things to do in Townsville beyond catching the ferry to Magnetic Island. 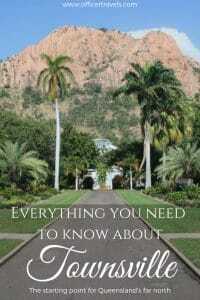 So here’s our quick rundown to help you plan your last minute Townsville trip! Its heritage dates back to before European settlers, back to a time when the Bindal and Wulgurukaba peoples ‘owned’ the land and called it “Thul Garrie Waja”. The Wulgurukaba people tell a story of how Magnetic Island and the neighbouring smaller islands were created; a giant snake went out to see and when his body broke into pieces his tail became Halifax Bay, his body is Palm Island and his head became Arcadia, Magnetic Island. These days, Townsville is a bustling little city that’s popular with Australians and international travellers alike. 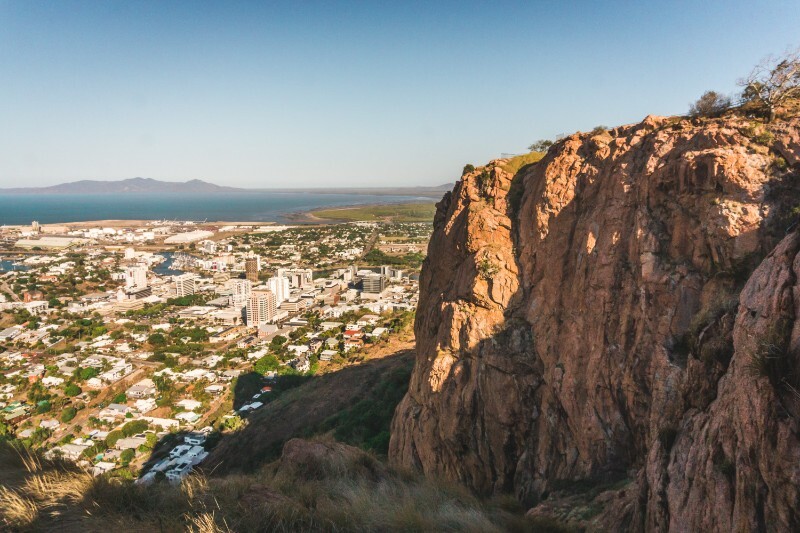 Townsville is the starting point for Far North Queensland, here you’ll start to see the landscape change from dry open lands to tropical rolling hills and beaches with crystal clear waters. It’s a launching pad for the Great Barrier Reef and a gateway to the UNESCO world heritage site ‘The Wet Tropics’. 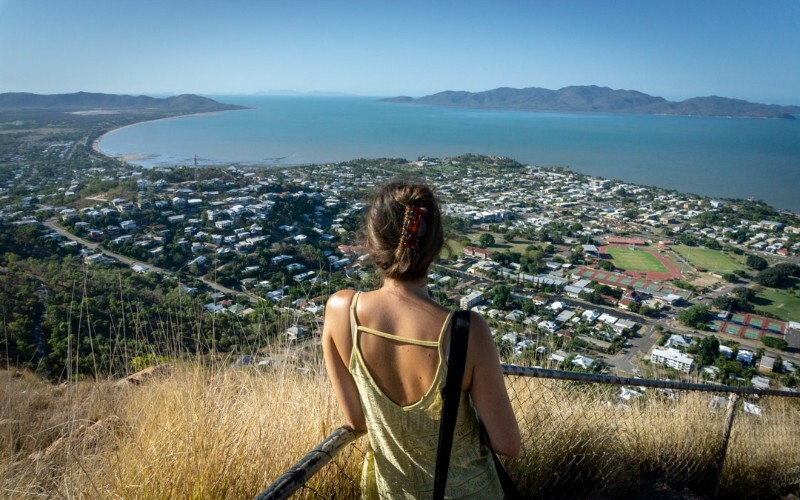 Castle Hill is 286m high so it’s the best place to get fantastic views of Townsville and out to Magnetic Island. While you can drive all the way to the top, it’s a popular fitness route for walkers and runners so if you fancy a challenge, why not join them? At the top of Castle Hill, there are 4 walking tracks that take you up a little further and give you different vantage points across the area. The track that goes above the toilet block gives an amazing view at sunset but get there early, we were amazed at how busy it got as colours filled the sky. On the north face of Castle Hill, you’ll see the infamous ‘Saint’. A graffiti piece that was done by rebelling kids in the ’80s but it’s now a piece of history and the locals voted against having it removed. The Strand is the main attraction in Townsville which encompasses the beach and the esplanade that runs alongside it. There’s a free sea water waterpark that looks out onto the beach at one end then if you follow the path along the Strand you’ll find a good selection of parks, BBQ areas as well as a wide range of cafes and bars. There’s a good sized free car park at one end and plenty of free roadside parking scattered along the Strand. Just like most cities in Australia, Townsville has a beautiful botanical garden filled with local and exotic plants. 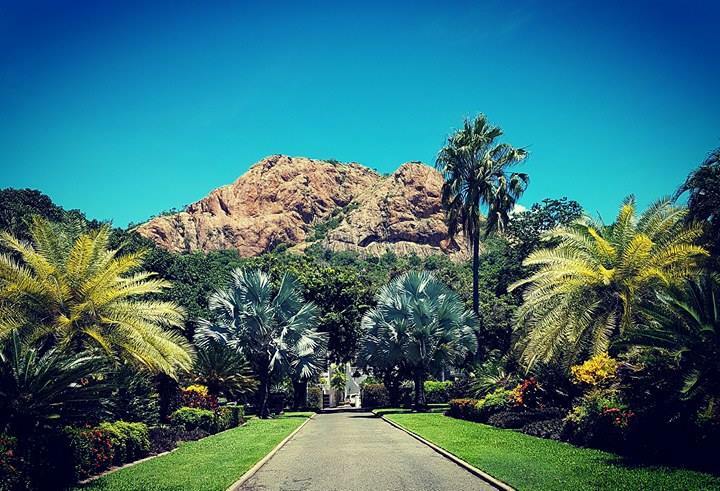 Queens Garden is Townsville’s oldest and covers an impressive 4 hectare of land, so there’s plenty of exploring to be done there including 2 hedge mazes and even a small aviary that has peacocks and cockatoos! From here you can get an amazing view of Castle Hill too. 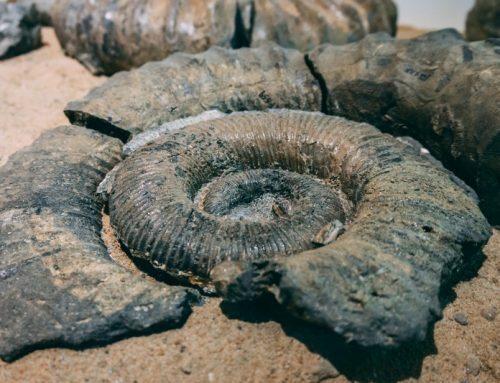 Just on the outskirts of the city, you’ll find one of our favourite attractions in Townsville. We loved Townsville’s pool not just because it’s free but also because of the amazing views from the infinity pool. The sports complex is located right next to the river and behind that you can see the start of the Tropical rainforest, there’s an Olympic sized swimming pool for doing your fitness but the real reason for visiting is the infinity pool overlooking the river. Another cool family-friendly addition next to the sports complex is the all abilities play area, this has play equipment that allows children in wheelchairs to join in the fun! If you’re travelling to Townsville in a camper van it’s worth noting that not only is the pool free, the parking is free and there’s also free hot showers too! It’s a travellers paradise. The Billabong Sanctuary in Townsville is like a mini Australia Zoo. A great day out if you’re craving some wildlife interactions. Get up close and personal to some of Australias most iconic wildlife and learn a bit more about the conservation efforts that go into supporting the wild population. Our favourite way to visit a place when we’re not in the van is through Air B+B. We love how homey they feel and often it’s cheaper than staying at hostels. If you haven’t signed up already, you can use our discount code to get yourself money off your first booking. Facilities; Toilets, showers, drinking water, pet-friendly, laundrette, kitchen, wifi, electric hookup. Facilities; Toilets, showers, drinking water, pet-friendly, laundrette, kitchen, electric hookup. We think you’ll love this post too! 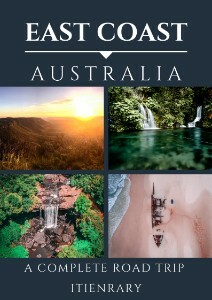 It’s full of Australia Camping inspiration!! This is where we stayed and our recommendation is to get there early to get a good spot. 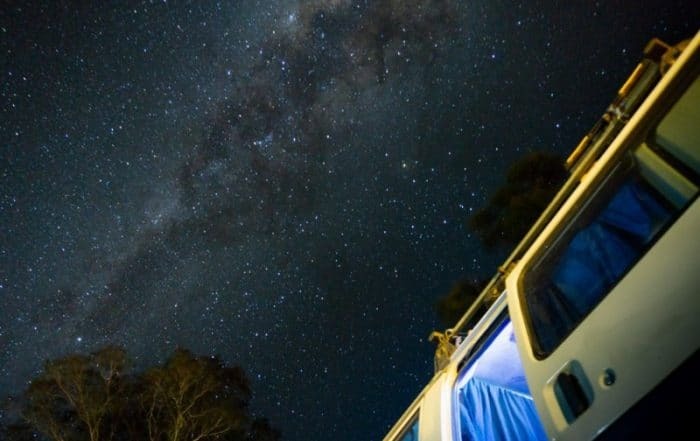 It’s the closest free camping near Townsville so it’s also the busiest. That doesn’t mean it’s not a good spot though! Its kitted out for trucks so it has all the facilities you would want, plus it’s right next to a Bunnings if you want to grab a $5 snag. Located 30 minutes outside of Townsville, Bluewater is a nice quiet camp surrounded by nature. Close to the river, there’s plenty of space and plenty of shade for you to park under. There are markets held here every Sunday which makes it a great place to refuel too. The final option for free camping near Townsville is Saunders beach, there are free showers and plenty of spaces to get parked. It’s located right next to the beach so at the weekends parking can still be limited. We find all of our free camps with the Wiki Camps app. Magnetic Island is the most popular day trip from Townsville and easily the number one reason why people visit in the first place. To do it justice you really need more than a day but if you’re short on time a day on Magnetic Island would be fine. It’s a haven for wildlife, so it’s not hard to find koala here and the rock wallabies are the friendliest residents on the island. Getting to Magnetic Island requires a ferry, you can either take your own or rent one when you get there. Accommodation options range from camping right through to Hostels, luxury hotels and air B+Bs. 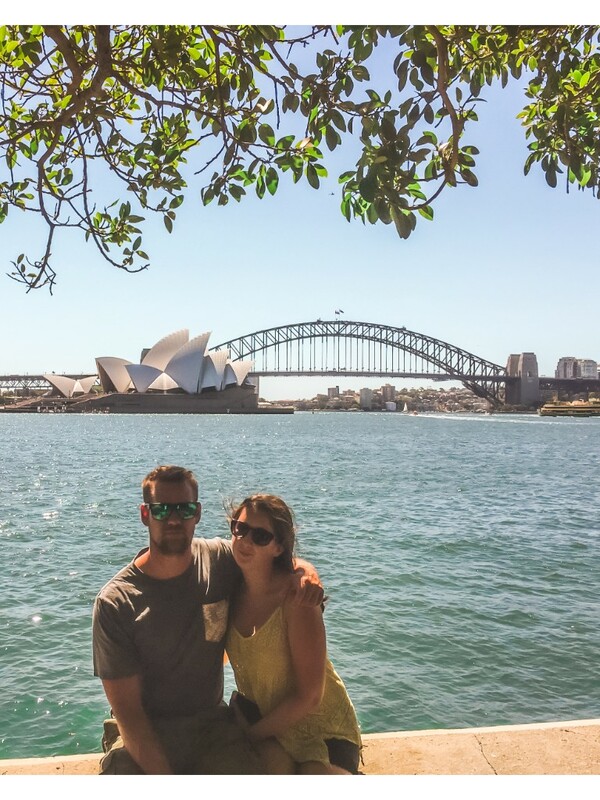 Get your ferry ticket in advance with GetYourGuide! Just a short drive past Saunders Beach is Rollingstones Park, there’s a free tent and campervan camping site here so if you fancy extending your day trip from Townsville it’s really easy to do so. Relax by the creeks or enjoy one of the weekly local markets and escape the hustle of the city. There’s a wide range of walking tracks along the creeks at Paluma Range but the leading attraction is Jourama Falls. Follow the track to the viewing platform, have a picnic and enjoy the fresh water swimming that the creeks have to offer. Just an hour from Townsville, Paluma Range forms part of the Wet Tropics, so this day trip from Townsville is a little glimpse into what Far North Queensland has to offer. Use bookme to find last minute deals for Magnetic Island. Cut down costs by shopping at Coles and enjoying one of the many sea view BBQ areas on the Strand. We really enjoyed our couple of days in Townsville and are actually planning a return trip as there’s a lot that we didn’t get to enjoy fully; like Magnetic Island! Have you visited any towns that were completely different from how you expected? Let us know in the comments and as always, head over to our Facebook and Instagram to join in the chats there!! I love paddling a board and can do it while visiting there. This is a town I’d totally love. Thanks for putting it on my radar. 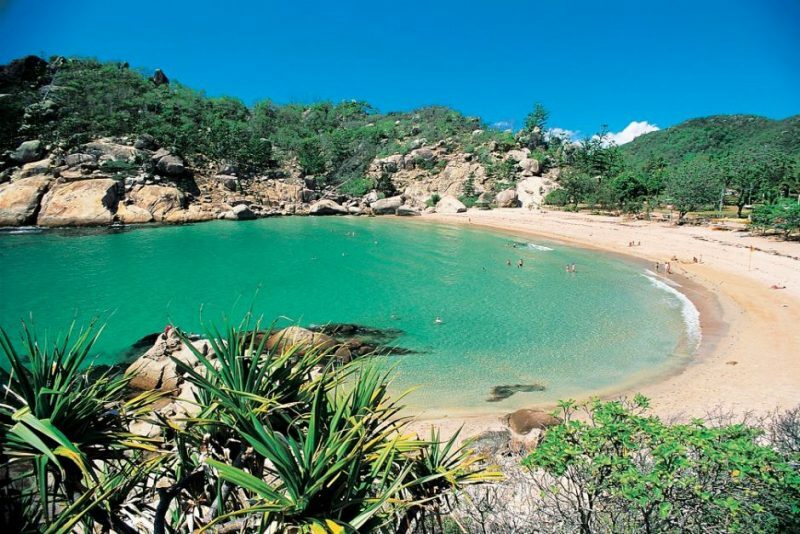 The view from Castle Hill is amazing, and the beach at Magnetic Island – wow – that green color! What a beautiful place. The Queen’s Gardens would be my first stop, to visit the Botanical Gardens. 😉 Love how your photos get bigger as you scroll over there. Nice touch! Townsville looks so pretty! The kids and I would have so much fun exploring the Queens Garden. I like that you give a lot of camping options for visiting Townsville. Townsville really is a great place for campers! Of course, plenty of hotels too but you can’t beat getting in with nature eh! I have! I love it when I go somewhere and it’s even better than what I had imagined it to be. I’m happy to hear you had a wonderful time in Townsville. Your footage is gorgeous and really captures the beauty here. 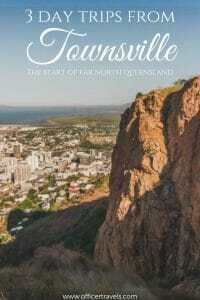 Townsville is really worthvisiting and I would love to have stunning views of Castle Hill. Magnetic Island is truly magnificient. Townsville – I have never heard of this place. But when I read your report I like it there. Here, tourism does not seem to have arrived as yet and to live life rather contemplatively. 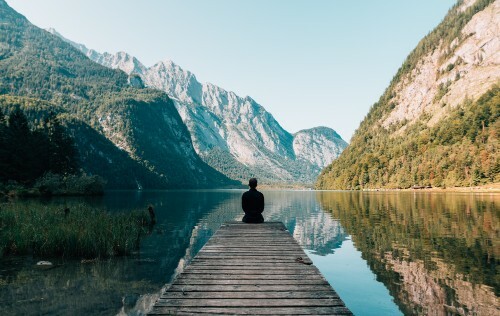 So an ideal place to relax. Aren’t last-minute getaways that turn out to be complete dreams awesome? I definitely want to visit Townsville. You had me at tropical rolling hills, crystal clear waters, launching pad for the Great Barrier Reef and gateway to a UNESCO site. SO many reasons to visit! Looks like a lot of good camping options as well. But my target would definitely be Magnetic Island, wow! This is an amazing post! I have heard of Townsville but really didn’t know too much about it. Your detailed account has given me a snapshot of what to expect, what to do and what to look forward to! Magnetic Island sounds like a must do! 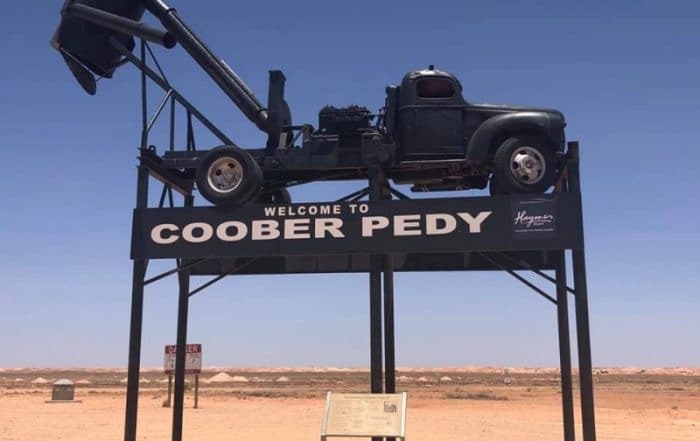 Added to the list of places to visit in Australia!